Ultra-compact and designed to fit neatly in the hand, the TK-2140/3140 portables are designed with the user in mind. 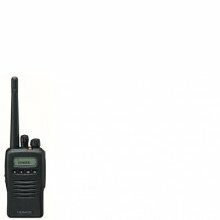 Weighing only 300g including the battery, these radios are packed with features and offer excellent reliability thanks to the tough die-cast chassis and weather-resistant construction. Small in size yet big on performance, the TK-2140/3140 are the stylish communicators from Kenwood. The 12-digit, 3-digit alphanumeric dot matrix (5 x 8) LCD display provides clear legibility under all lighting conditions. The main 12 alphanumeric characters are for displaying such information as system/group name/channel name aliases. The 3-character sub-line can be programmed for channel or group number. The TK-2140/3140 offer a lightweight Li-Ion battery (KNB-24L), ideal for low-temperature environments; a durable NiCd battery (KNB-25A); and a powerful NiMH battery (KNB-26N) for extra-long life. Flash memory permits updates, advanced feature sets and system architectural changes to be made electronically, without ever opening the unit. New battery release structure has been adopted by placing movable parts on the battery for improved reliability. The call function can be used for emergency signalling to send a help signal to a pre-determined person or group of people. TK-2140/3140 radios are equipped with an extralarge 36mm diameter speaker to deliver a 500mW of audio power for clear communication. Synthesized channel frequency generation provides a maximum of 250 channels. Built-in modem on the TK-2140/3140 enables simple data transmission including Status Message and Short Data Message, as well as other DMS (Digital Message System) functions. The ergonomic design of the TK-2140/3140 fits neatly in your hand, yet weighs only 300g even with the Li-Ion battery. Each key (except PTT) is programmable for any radio feature allowing the unit to be customized to fit user needs. amount of charge remaining by visual indication (icons) or tone alert. The listener can hear the sender’s voice even at the lowest volume setting to avoid missed calls.